Here is the long version of Lilly’s obituary, including some of the last photos ever taken of her and a few details about her final days. Lilly Elizabeth Hawn, 9, crossed over Tuesday, December 17, 2013, after a lengthy battle with rabies vaccine-induced meningoencephalomyelitis and the side-effects of treatment. 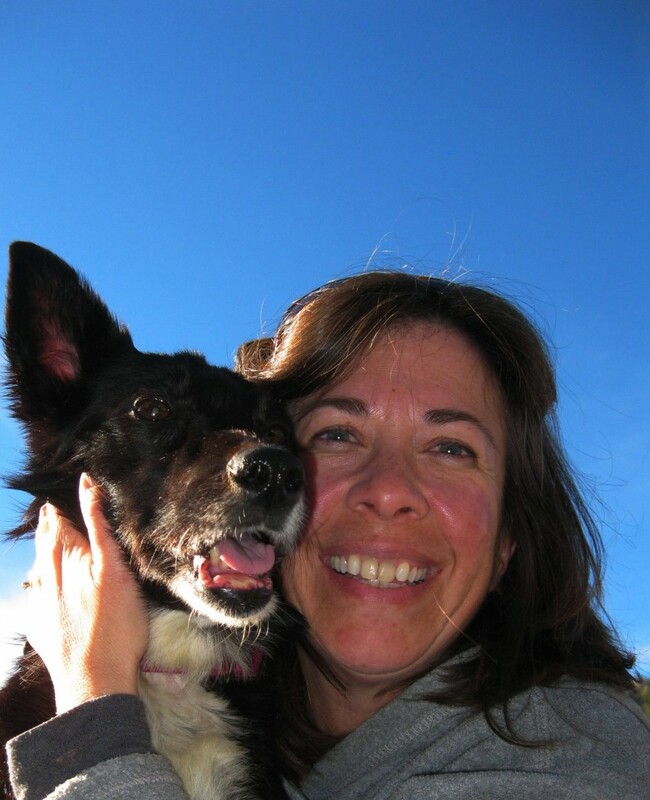 She was my Heart Dog – my canine soul mate. Life without her feels unimaginable. Lilly was funny and smart. She learned a number of advanced dog tricks and knew some 100 words. In her prime, Lilly looked and moved like the perfect combination of a ballerina and a kick boxer. Completely ripped with muscles, she could leap incredible heights with seemingly zero effort. Lilly loved to play fetch. She proved to be an accomplished hiking companion, often setting a blistering pace with me huffpuffling behind her. This is the last photo ever taken of me and Lilly together (November 9, 2013). Thanks to an apparent stomach of steel, she frequently rode in the car up and down our steep, winding Rocky Mountain canyon road on our way to various adventures together. Some of my best memories include driving around in the summer with the windows down and the sunroof open – just a couple of girls having a great day. Unlike so many of our friends with competitive titles galore, Lilly enjoyed but never competed at agility, herding, and rally. There would be no dog sport championships for us. That’s why we named the blog Champion of My Heart. It remains the championship that matters most to us. Every day that I knew Lilly I loved her more than the last. I will love her forever. I gave Lilly everything I had – and many things I didn’t – financially, emotionally, and otherwise. When she became so dangerously ill in January 2012, after the routine rabies vaccination, we fought as hard and as long as we could. And, lose we did. Along the way, however, we won a million ways in every moment together – big and small. 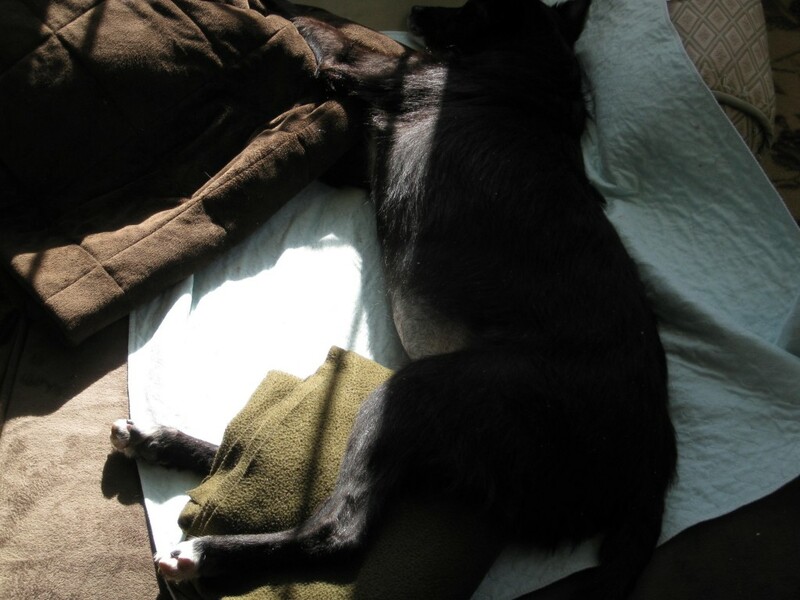 The day before Lilly died, she smiled at my side, perched on a combination of two dog beds we’d rigged together for greatest possible comfort. She ate well, gave us probably 1,000 kisses, and was strong enough to greet her Daddy at the door when he got home from work. The last photo ever taken of Lilly (December 16, 2013). Again and again, she said “Thank you” and “I love you” with her beautiful smile and inspirational strength. The final stage of her illness came quickly and decisively – leaving us no doubt it was time to let her go. In the days since, we’ve found that swift conclusion both haunting and a blessing. Devastating doesn’t even begin to describe the loss of my best, best friend. In recent years as human friendships failed me in countless ways, this dog – this brave, wonderful, miracle of a dog – remained at my side. Matching me step for step. Breath for breath. Heart for heart. Goodbye, beautiful girl. Thank you for everything. My life will never be the same. Roxanne – while I am new to your blog, this post has left me a blubbery mess. We lost our #suckhole just 4 days before your beautiful Lilly crossed over. Today the pain is as raw as it was on Friday the 13th. There are no words. From one dog lover to another, my heart aches for you. What a lovely tribute, Rox. Thank you for sharing your heart dog with us. Her love spread far and wide across the country. So poignant – and simply beautiful. I wish that words could heal, and strip away the aching loss you feel…. Heart animals are forever. May the pain transition to sweet memories for you soon. Many healing purrs sent your way…. I hadn’t read this when I posted my earlier comment. I am so sorry, you fought such a hard battle and were so devoted to her. I am so sorry. I just now learned of your sweet girl’s crossing over. My heart aches for you. I know your connection with Lilly is profound and beyond all words. Lilly was a champion to the end, and so were/are you. You were both so fortunate to be in each other’s lives. Know I am thinking about you and that you and your sweet girl are in my thoughts and prayers. Lilly will be missed, at home and abroad. I’ve always thought you are a wonderful writer — but, man, I think Lilly was writing this with you. Hugs! Thank you for sharing such a beautiful tribute to Lilly. This is a Very Inspiring Beautiful Love Story! Shows deep respect & admiration for Lilly & she showed back to her Wonderful Owners..I certainly hope that I am half as good to my Wonderful Pets..Thank You Lilly & Roxanne for paving us this path. Our hearts go out to you. I know there are no words to express your feeling of loss, but this was a wonderful tribute to Lilly. She would smile at it. Thank you for sharing her story with us. My heart goes out to you. What a beautiful obituary. I can’t even imagine how much you miss your sweet Lilly. I don’t think we ever get over the loss of these “soul animals,” but we do learn to live with the loss. Lilly’s legacy will live on. I wish you moments of peace, and an occasional smile as you remember your beautiful girl. The pain will lessen in time. Be gentle with yourself. Sending you virtual hugs…you were such a lifeline for Lilly…and always positive and thinking of her. You gave it your all…and then some. Lilly is now pain-free, and you will see her one day. For now, I’m hoping your memories will give you much comfort. (((HUGS)))) from Ohio. The best tribute to a dog I’ve ever read. I confess that I have spent these (nearly) past two weeks alternating between letting a few tears fall for Lilly and you, and laughing – against my will – whenever I think about the time you wrote about Lilly high-jumping around you – sailing sometimes higher than your head. She did match you breath for breath and heart for heart. And I know she will stay around you always. You too are the champion of her heart, just as a previous reader so eloquently stated. I’m so sorry for your grief. It pains me to hear of it, yet I am glad you share. You have so many kindred souls out here. Never forget it and post about Lilly as often and whenever you want. Your grief is double, maybe even triple. It is expected grief and yet it is also acute grief – the mixture of both makes you work even harder. Our thoughts are with you and Lilly. We should all live so well ~ until the very end. This is how I dealt with my husband’s fight with Parkinson’s Disease. We lived as well as we could until his spirit had to leave his body. God bless you in your sorrow. Someday the memories will not be so painful. My heart is with you. It’s impossible to express the pain of what such a loss brings, but you’ve done it beautifully. http://www.youtube.com/watch?v=N5gBxKEgZqM. It says it all…. Thinking of you. A beautiful tribute to the purest kind of love. My heart goes out to you. Gentle purrs of healing as you go through this difficult transition. Roxanne, I just now heard the news of Lilly’s passing. Your tribute is as beautiful as Lilly’s spirit, which will continue to live on in your heart – and the hearts that Lilly touched along the way. Janiss recently posted..Sunday Catinee: Big Cats Destroy Christmas Trees! Tears. What a wonderful tribute to a special dog. She will always be in your heart, but also, in our hearts. We will never forget her unfolding story from the very beginning. Thank you for writing about her all these years. Her tribute truly depicts how much she meant to you — and as for the rest of her followers — we miss her so. You and Lilly had an incredible journey together and that’s such a lovely tribute. Your ever faithful friend will be forever in your memories and in your heart. I am not surprised that her last day with you was full of smiles and kisses. So true to her story. I am different in the world because of the story you shared of your partnership with Lilly. I am immensely different with my own canine partner. Thank you for the brave and “all in” telling of Lilly and your heart bond with this magnificent being. You continue to honor her spirit in a manner that inspires me to be better. Lilly’s life and your sharing fill me with love and compassion and even boldness. Much love and light to you and Tom. “Devastating doesn’t even begin to describe the loss of my best, best friend. In recent years as human friendships failed me in countless ways, this dog – this brave, wonderful, miracle of a dog – remained at my side. These words describe the loss so eloquently, I cry as I read them. It is almost 2 years since the loss of my dearest friend. We were together 24/7 for 15 years. Some days I am still in shock she is not next to me. I try to keep busy, I foster, I volunteer, for I really enjoy animals more than most people I know! She gave me strength, joy, laughter, fun….all bundled up in a beautiful furry creature. I quess we are lucky to experience that rare bond and love….but it makes it all that much harder to live without them. I feel your pain and your loss, and wish you moments of peace as you move through your days. What a wonderful tribute to Lilly and your relationship together. I wish you peace of mind…you did everything you could for her. Linda Martin recently posted..This will amaze you…and you will love it!!! Roxanne-Thank you for this heartfelt obituary. It isa wonderful tribute to Lilly. I wish I had known her personally. She was one lucky pup to have been loved so completely by you. You and Tom are awesome people. I pray your grief will ease soon but I know it will never go away completely. Love to all of you. That was beautiful. Life is so terribly fleeting…but she will remain in your heart forever. What a beautiful tribute. I never knew the reason behind the name of your blog. And it couldn’t have had a better name. You and Lilly have fought so brave together, never have I know or read about a couple so brave, against all odds. We keep you as champions of our hearts, too. A beautiful companion – then, now, always. And a beautiful tribute to a very special pup. So very sorry, wishing there were words to help. Theresa & Prudence recently posted..Merry Christmas!